Comments Refreshing and life-infusing, such is the aura of the gemstone featured today – a fine 3.22 carat cushion cut peridot from Burma! The gorgeous natural and treatment-free peridot has good jyotish weight and has a lovely rich olivine green color with excellent clarity – the kind that is coveted in a prized peridot. It has been set in sterling silver as a Mercury talisman and has the symbol of Mercury standing in relief on the pendant bail. The gem does absolute justice to the reputation to the legend of its place of origin – Burma, the famed land, which has been known for giving the world best quality gemstones. 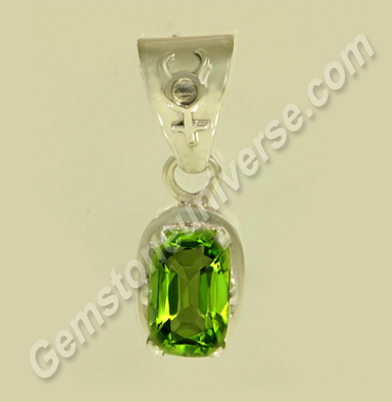 Peridot or zabarjad is the substitute gem for natural emerald/panna gemstone. It is used to harness the energies of Planet Mercury/ Budh. You may also find some traders selling it in the name of ‘Evening emerald’! However, a peridot is NOT an emerald. Ethical trade practices require a gem to be sold by its real name and that any treatments be disclosed to the buyer. Euphemisms in gem trade have been coined to add a measure of romance ultimately fetching a better price for ‘possibly not such a valuable gem. For instance, red spinel has often been sold under the euphemism – ‘Balas ruby’! It does not make spinel, a ruby! Peridot is a gem of the mineral forsteritic olivine. And natural emerald is a gem of the beryl group. They could not be any more different!